Bridget came on board this fall and is new to the renewable energy industry. She was drawn to Suncommon for the values they hold and feels aligned with their business practices. She enjoys the work environment and the wonderful folks on her team. 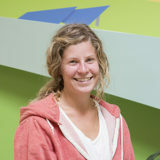 Bridget came from an organic farming background, and is excited to progress her efforts to better our planet. As a Waterbury resident, working at Suncommon puts her a bit closer to home. When she’s not up on a roof, installing panels, you can find Bridget hiking our lovely Vermont trails with her lab terrier mix, Mac.